Christmas season has begun. Lots of advertisements, lots of enticements to shop, splurge, spend money. The message is that if you love someone, you should buy something. If you want something for yourself, get it too. You deserve it. I’m afraid they’re out of luck with us; we have no money to spend. All those circulars go into the recycling, while I scrounge the best clearance places. I have a stash of gifts-in-waiting, and I tally up the lists and see who’s not covered yet. I do want to give something to those I love that they will enjoy, but I have to do it simply. Thanksgiving is now behind us. Christmas music is playing everywhere, at least sporadically. It varies from the schmaltzy commercial tunes to the reverently rejoicing carols, with childhood fun selections in between, and it will become more constant the nearer the date approaches. So will the frenzy and the stress. It’s possible to even turn the desire to remember Christ into an argument, which will not bring His peace into the process. It’s easy to become overscheduled, overanxious, and overwhelmed. A few years ago our local stakes picked up on a Christmas idea from something that had been done in other areas, and created a weekend Festival of the Nativity. 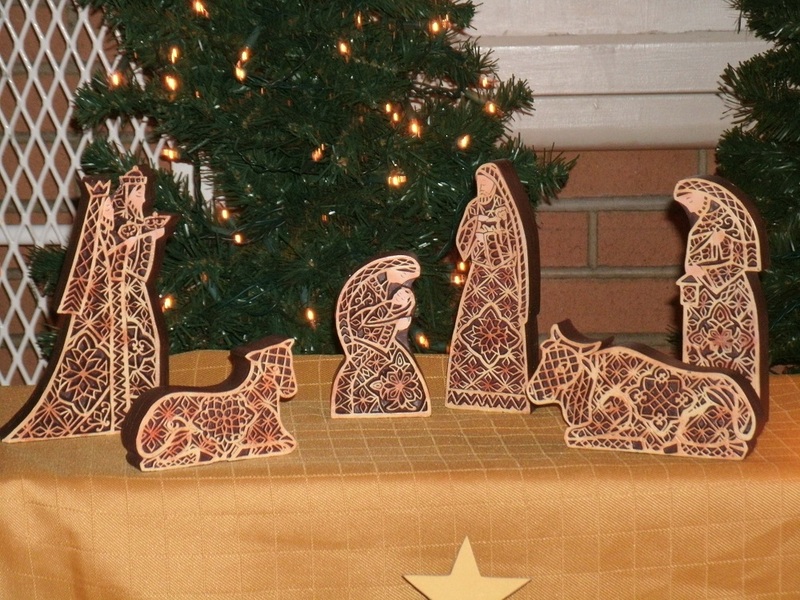 The idea was to ask members to lend whatever types of nativity sets they had and then set up a program displaying these for a weekend, inviting any and all to come. A sign-up for displays, lights, poinsettias, art prints, and hosting shifts went around every ward. Many a small child sat on this front ledge (the edge is just showing) to touch the baby Jesus in the manger. The backdrop is a tri-fold, and the flash caught the reflection a bit differently with the angles. 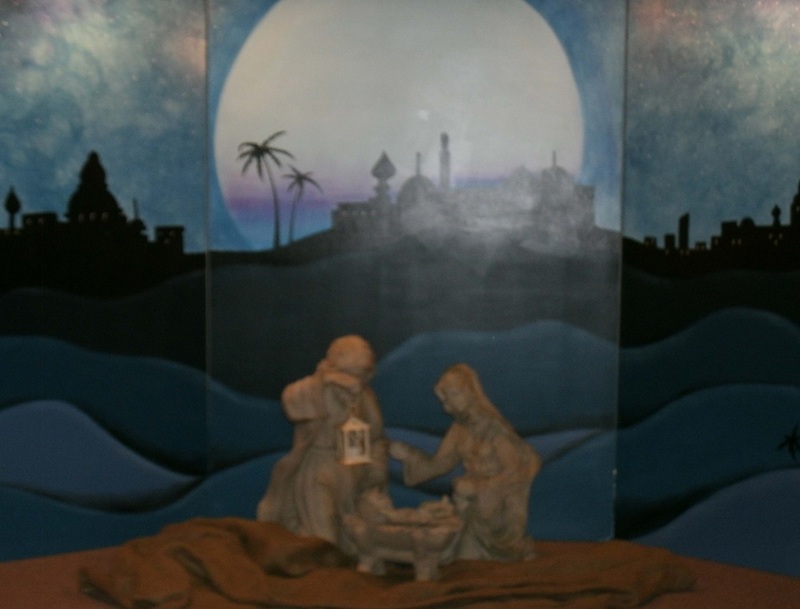 Parents started to say to their little kids, “No, get away,” and then thought again and took pictures of their children sitting by the manger. When asked by someone if I was going to go, I shrugged and said I didn’t know. It didn’t sound all that exciting to me — now if it had been a music performance, I would have been putting it on my calendar. But I wasn’t sure this was important. Silly me. More than one of my friends told me that I had missed a real treat. When the festival was repeated the following year my husband and I went and thought it was lovely. 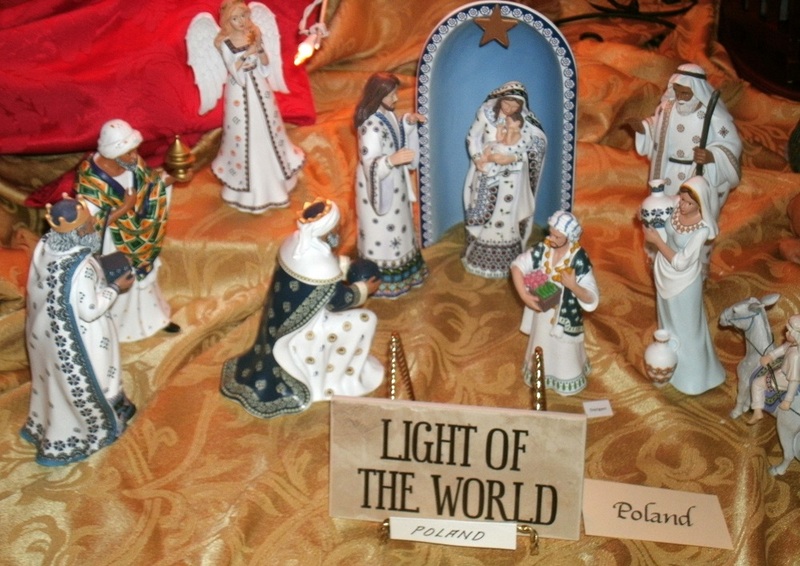 The cultural hall was set up with tables, trees, lights, flowers, and all kinds of nativity depictions from large to tiny. I don’t know whether the wood cuts were made with laser or by hand. Participants entered one of the corner doors and meandered through like a “lazy river” feature at a water park; there were no straight lines and there was no hurry. But the transforming perspective came, as it often does, through seeing the festival through the eyes of another person. We invited a couple, good friends of ours, to meet up and go with us last year. We had had a few gospel discussions, gotten together for dinner a few times, and progressed from two girlfriends to a foursome. In this set from Poland, the details on the robes are traditional patterns from pottery and dishes. Our family had also gone caroling at Christmas to them the past few years, ever since I had found out that no one had ever done that in her life. It turned out that they had had a number of nativity sets themselves, of various types, but in the need to downsize their lives she had parted with most of them. She walked about entranced, enjoying the whimsical ones — she had kept a small Peanuts character set out of hers, just because it was fun — and the exotic ones. They were struck by the variety and the grace of so many styles from around the world, which reverently depicted the Christ Child, Mary and Joseph, and the angels, wise men, and animals from the stable. We moved about slowly as she drank them all in and he nodded at the ones she exclaimed over. It was a charmed evening, and she could hardly wait for this year. When we went with them this weekend, they spent more time in the long side room filled with pictures of the Savior from many sources, and picked up a copy of “The Living Christ” by our present-day apostles. I whispered to her, “Can anyone sit in this room, filled with this art, and think that we are not Christians?” No, she couldn’t imagine. We could feel the spirit of testimony. There were musical interludes in the chapel, and we went to sit a bit and listen to a high school choir group. There was a children’s room on one hall, and a live nativity setting in the center of the gym. We watched children with their activity logs hunting for labels, as a written scavenger hunt, that were set up on the various tables. What kind of labels? The titles and names of Christ, and such places as Bethlehem, Judea, or Jerusalem. It was a reverent place, making us contemplate his roles as Advocate, Messiah, Redeemer, Light of the World. There was such beautiful light everywhere. I took some pictures, but I had a problem with the camera, and most of them did not come out well. It’s a very basic camera and I’m not expert; the tree lights and the table lamps made it hard with or without the flash. There are a few that did come out. Thanksgiving, in its opening us to gratitude, is a fitting lead-in to the Christmas season, when we celebrate the coming of the King for whom we should be more grateful than for any other gift. It’s easy to bustle and worry and rush and go crazy, forgetting to take quiet time to remember Who matters most in it all. Whatever might be available to you, even if you have to create it yourself, find something that stills your busy life and makes your heart rejoice in this season of celebrating our Savior’s birth. Gather your loved ones in with you, and let Him gather you in too.